Affordable, yet created for professionals; the 3851A integrates sophisticated technology with simplified measurement. Single Axis Measurement, ten times more sensitive than the Beginner/ Intermediate level meters - puts measurement control in the hands of the technician. F1B2H31 Filter, built in module provides manual isolation of frequency clutter - delivers source identification with ease, efficiency and precision. Output Interfacing Capabilities, AC/DC outputs facilitate data logging and use of a full spectrum analyzer - means more in-depth analysis and unmanned measurement. During the manufacturing process, strict calibration procedures are followed using only high end, calibrated measurement instruments. 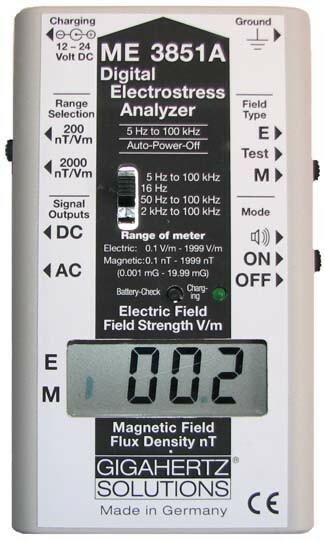 This guarantees that every ME 3851 meter made by Gigahertz has been individually calibrated to a traceable standard. Official calibration certification is available upon request for a fee of $245.00 CAD. A half day is required to complete the measurement protocol required for this process.